work for moon on woods. under rumble of blue pick-up trucks. zipper-green creeks and sorrel horses blow hot. A grasshopper splats on the boardwalk. a steep gravel road without shade. 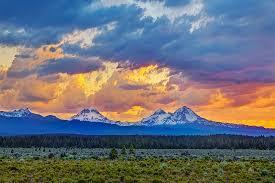 Poet’s Notes: Sisters (pictured) is a beautiful spot in Oregon just over the mountains from Portland.